Fall is particularly abundant with garden grown eggplant. 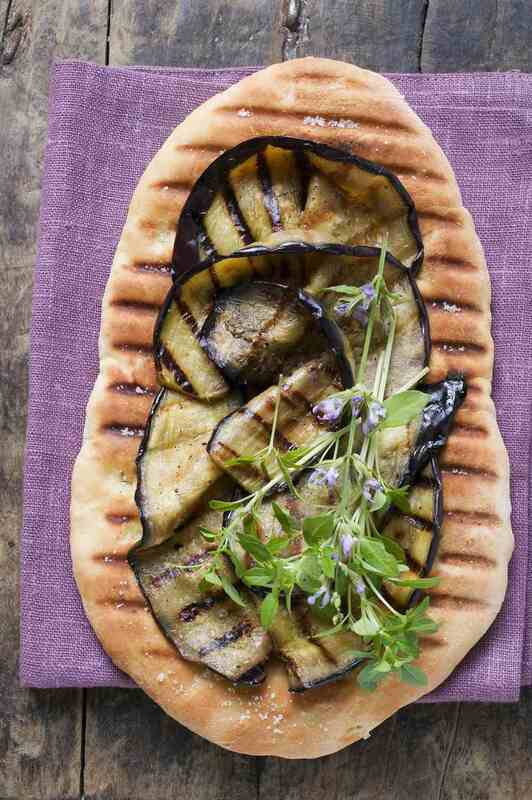 If you find yourself inundated with a large eggplant harvest, then this is a must try recipe. Simple, rustic, and fantastic these can be served as a main dish or cut into smaller slices and serve along with goat cheese vinaigrette. 1. Slicing the eggplant depends of the variety you are working with. For longer Asian eggplant, cut into long pieces. If you using globe eggplant, cut into rounds. Rub salt onto exposed flesh and place onto a wire wrack with a pan underneath. This will help to leech the bitter liquid out of the eggplant. Let them sit this way for about 1 hour. Quickly rinse of salt and excess liquid from eggplant pieces. Pat dry with a clean kitchen towel of paper towels. Set aside. 2. While eggplant is set to leech, prepare vinaigrette. Place all ingredients into a blender and blend for 15 10-15 seconds. Taste for salt content and add more if needed. Pour out into a bowl, cover and place into fridge until about 15 minutes before flatbread is ready to serve. 3. Preheat grill for medium high heat. Brush exposed flesh with olive oil and season with a little black pepper. Place onto grill and cook for 2 minutes per side (or more depending on thickness.) Once tender, remove and place onto a large platter. Cover with foil and set aside. 4. combine about 1/4 cup/60 mL olive oil with grated garlic. Set aside. 5. Roll out dough, forming two oblong shaped flatbread (about 1" thick). Oil grill grates well. Place flatbread onto grill and cook one side for about 3-4 minutes until it has nice grill marks and starts to form a golden brown color. 6. Remove from grill and brush uncooked side with plain olive oil. Turn over so cooked side is facing up. Brush with olive oil-garlic mixture. Arrange grilled eggplant on top. Return flatbread to the grill. Place uncooked side down, close lid and continue cooking for 5-6 minutes or until dough is sturdy and golden brown. 7. Once cooked, remove flatbread from grill, sprinkle with sea salt flakes and top with baby arugula or any herb or micro green of choice. Cut into pieces and serve with goat cheese vinaigrette on the side.